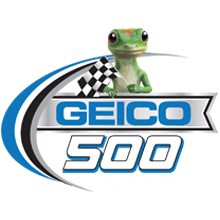 GEICO 500 Packages are on sale. Join PRIMESPORT, the Official Fan Travel Partner of Talladega Superspeedway, in Talladega next year for the GEICO 500, the first of two Monster Energy NASCAR Cup Series races at 'Dega. Our Official GEICO 500 Travel Packages can include hotel accommodations, race tickets, transportation, FanVision rental, souvenirs and more! Get your Talladega Spring Race packages today from PRIMESPORT, the Official Travel Partner of Talladega Superspeedway! Let PRIMESPORT handle your GEICO 500 travel needs so you don't have to worry about a thing. Talladega Superspeedway, located in Lincoln, Alabama, is the home of two Monster Energy NASCAR Cup Series races. Since opening in 1969 it has become the longest NASCAR track with a length of 2.66 miles long. With speeds in excess of 200 miles per hour, wrecks at Talladega can be terrifying. Small mistakes can lead to huge wrecks and Talladega has become home to "the Big One" over the years due to the multi-car wrecks that take place at the track. Talladega Superspeedway hosts two races each year, one in late April or early May, usually the same weekend as the Kentucky Derby if in May, and one in October. Seating capacity is currently at 80,000 and previous race winners at Talladega Superspeedway include Donnie Allison, David Pearson, Cale Yarborough, Dale Earnhardt, Dale Earnhardt Jr., and Jimmie Johnson.